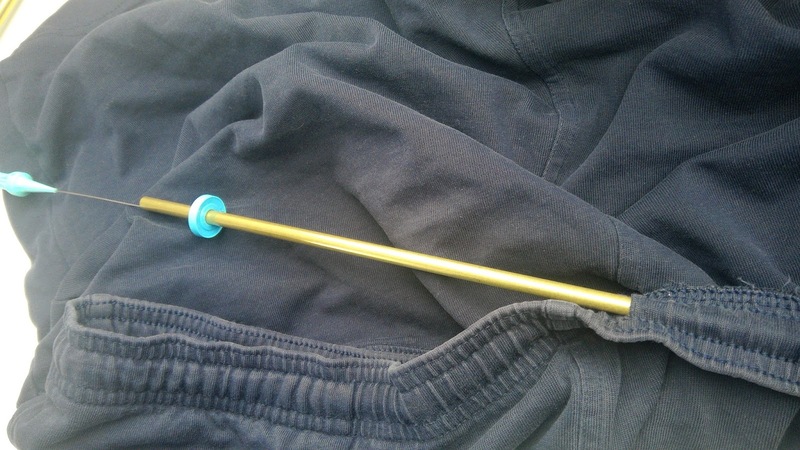 When the drawstring gets lost inside the waistband, use your Fasturn tools to fish it out. Insert the largest tube that will fit into the opening until you reach the end of the drawstring and then use one of the metal wire thingies to grab it. Even if the drawstring is too big to go inside the tube, the tube is still useful to prevent the wire thingie from grabbing the inside of the opening. It helps to wiggle the end of the drawstring and tube with your fingers until you can get the end of the string inside the tube or butted up against it. And patience too, because it may take a few tries. And then I sew the buttonhole opening a little smaller so that the knotted end won't slip inside again. These are my husband's shorts and at least the second time I've fished out the drawstring!